Mid-Life Cruising!!! : Sailing With Our New Sail Pack & Lazy Jacks! Sailing With Our New Sail Pack & Lazy Jacks! After replacing our running rigging, it was finally time to pull out our sails & sail pack out of storage. If you've been following along, you know that we've been emptying our storage lately .. first the Tohatsu, then the dinghy, followed by the bimini, and finally .. the sails! This was an exciting time for us, as Nirvana hadn't had her sails on since somewhere around 2012. Had it been that long?! I had to look up old posts on this blog to figure out just how long it had been. 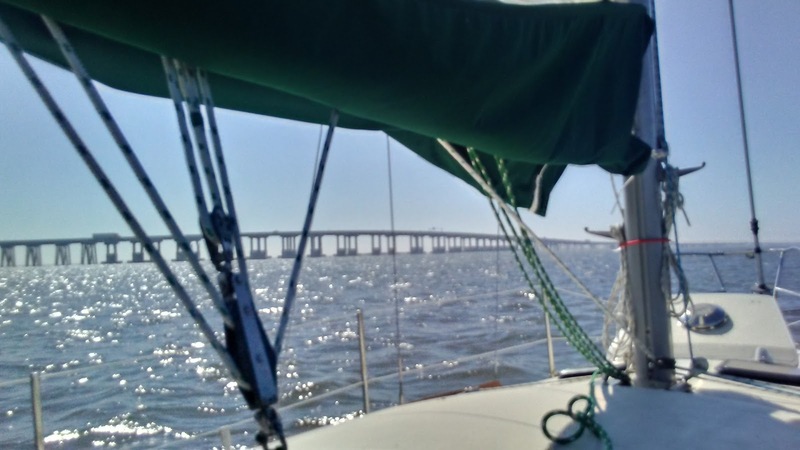 The post from our last sail was written just after we put our house up for sale. As you could tell by the title and the post ... I had no idea so many years would pass by before sailing Nirvana again. 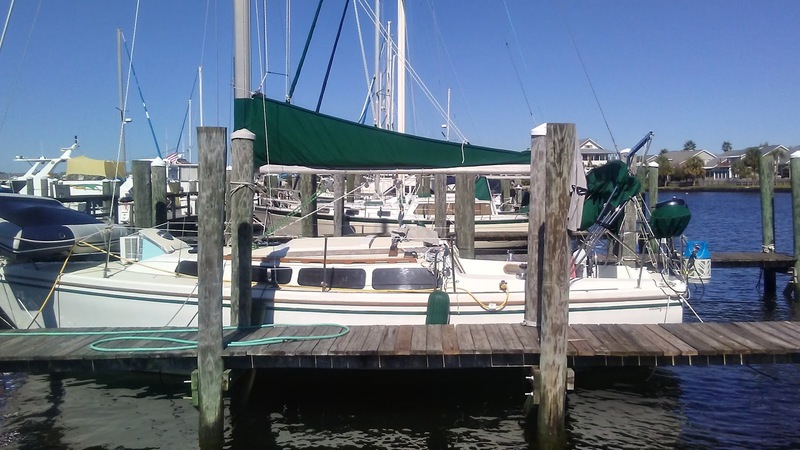 After so many years, Nirvana would finally be a sailboat again, and hopefully we'd be sailing soon! 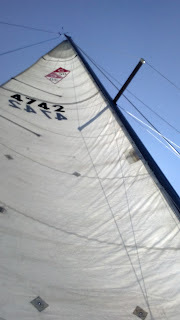 Ken and I brought the main sail and sail pack to the boat, and tried to remember how to add our sail pack. We weren't very familiar with our sail pack, as it was sewn back in 2012 and then, you guessed it .. put in storage. As you can see from photos taken after the sail pack was sewn, we had the seamstress sew slugs into the bottom of the sail pack. We have a loose-footed main, and decided this would be a good way to secure the sail pack to the boom. Knowing little about sailing, we hoped that our solution would work. 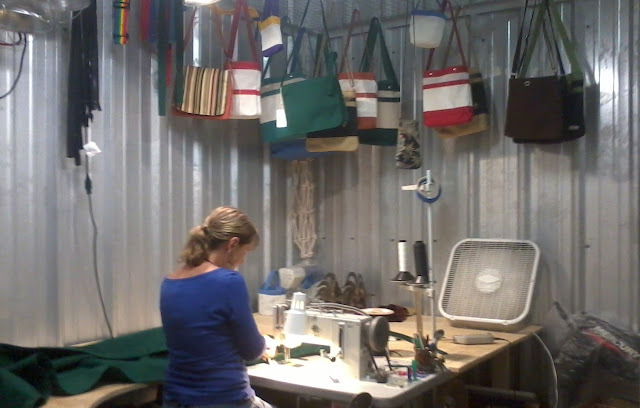 Here's a photo of Robin back in 2012, sewing our sail pack. Robin did a fantastic job! 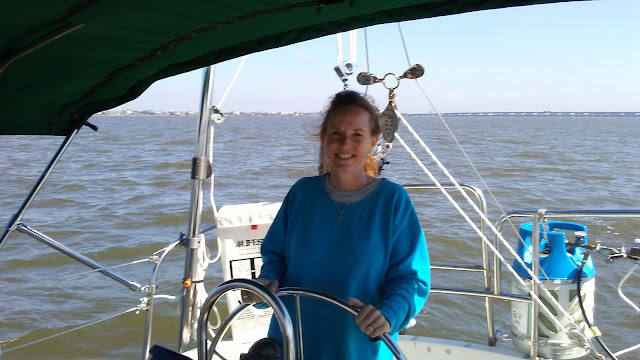 We were lucky to have her sew our sail pack (learn how we found her through another cruiser here), and even luckier to have won the Sail Pack Kit from Sailrite. My entry into the contest can be found here. 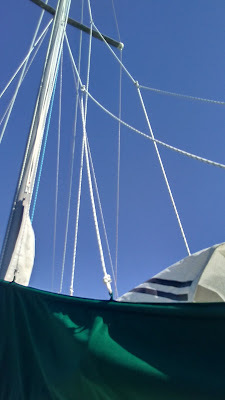 After sliding the sail pack slugs onto the boom, it was time to add the main sail .. or was it?! When trying to add the main, we realized that we needed to start over. We removed the sail pack and played around with the main sail for just a bit .. it's big & heavy! We decided to slide the first slug of the sail pack onto the boom, then attached the main sail to the outhaul, then slide the remaining sail pack slugs into the boom. It seemed this set-up would work, but we still needed to insert a piece of 3/4" 40 PVC pipe to the pockets on each side of the sail pack and figure out how we wanted to set up our new lazy jacks. When the sail pack was sewn, we had Robin add loops for the lazy jacks that Ken was going to make. Our sail pack has three loops on each side, starting 18" away from the mast. We then have another loop on each side that is 4' further down, then one last loop another 4' down. With a total of two blocks, four stainless rings (cheaper than blocks) and random rope that we had for a trial run, Ken set up our retractable lazy jack system. Once he was happy with it, he added the permanent lazy jack lines. We didn't utilize all of the loops that we had sewn on our sail pack .. who could remember our plans from so long ago?! 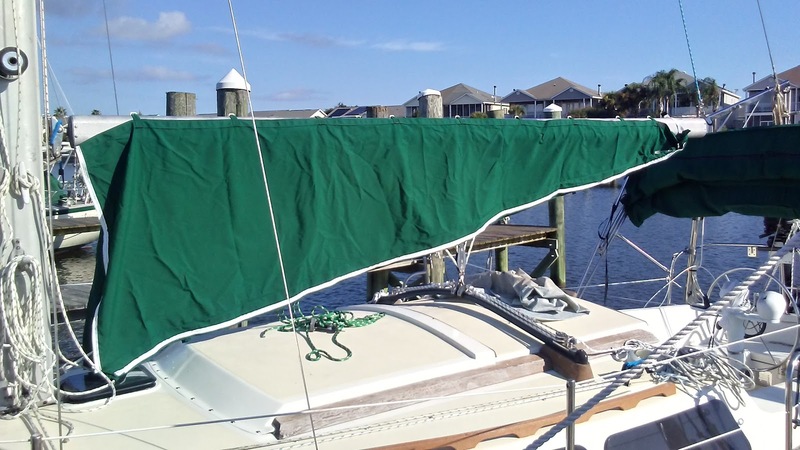 Here's a photo of our sail pack with PVC pipe and lazy jacks ..
With our new bimini canvas, new bimini frame and new running rigging, Nirvana is looking ready for a sail. She has come such a long way in the past year! With all the projects we've done, we thought we were ready to add our head sail as well. 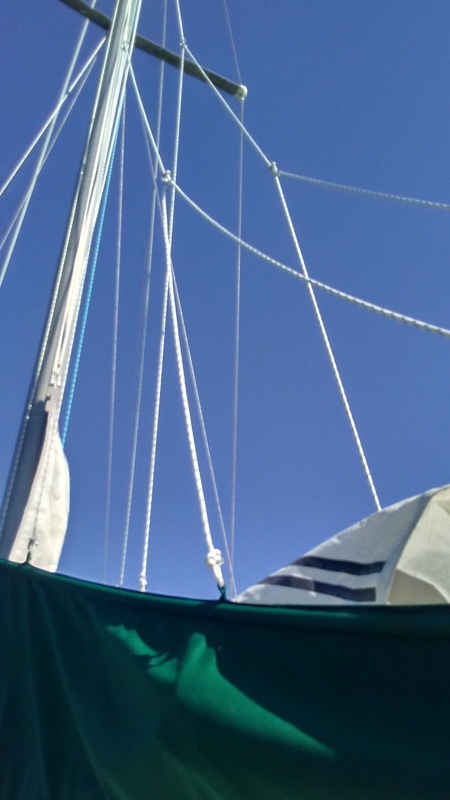 But, after the rigger recently pointed out some areas of concern on our standing rigging .. we decided to take his recommendation and have all of the standing rigging replaced. This decision was not made lightly, as this meant a delay on sailing further South .. and more money! So anyway, we could have added our head sail but since it would soon be taken down to remove the roller furler and replace the wire underneath .. we decided to take advantage of a beautiful day and try out our new sail pack and lazy jacks. Ken and I were both excited and nervous to leave the dock! 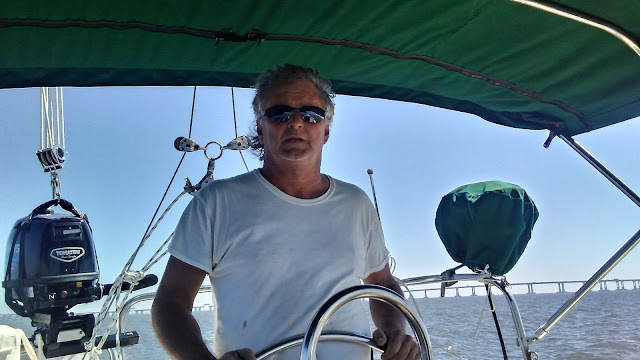 It had been almost a year & a half since we motored to the marina, and as I mentioned .. about six years since we'd done any kind of sailing on Nirvana! As we motored into the lake, it was time to test things out. As recommended by many, we made sure that the lazy jacks were retracted and we pointed into the wind before Ken raised the main sail. The sail didn't catch on the lazy jacks, and the sail went up without a hitch. A while back we had the rigger install new masthead sheaves, so we were also giving the new sheaves a test. Ken said they did seem to make raising the main less difficult. So far, so good! As Ken turned off the engine, we began to relax a bit. The sound of nothing but the waves and the wind against the sail was long overdue. It felt so good to be back on the lake .. on our own boat! 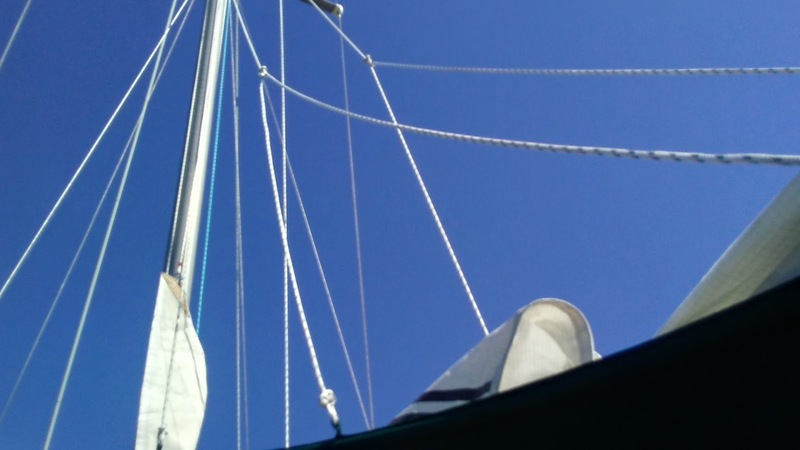 We wondered how it would be to sail with a sail pack, and with it "relaxed" along the boom (photo above) ... it didn't interfere at all. We spent a few hours on the lake, tacking a few times and getting re-acquainted with Nirvana. Slowly, our anxiety was replaced with enjoyment and I couldn't stop smiling. We only had one sail on Nirvana, but we were sailing! 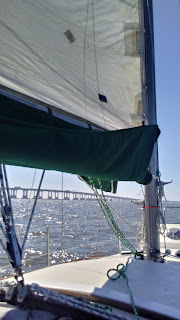 We enjoyed the day, and eventually released our lazy jacks before lowering the main sail. We weren't sure what we were going to think of our new lazy jacks and sail pack, but once Ken lowered the sail .. we were impressed! 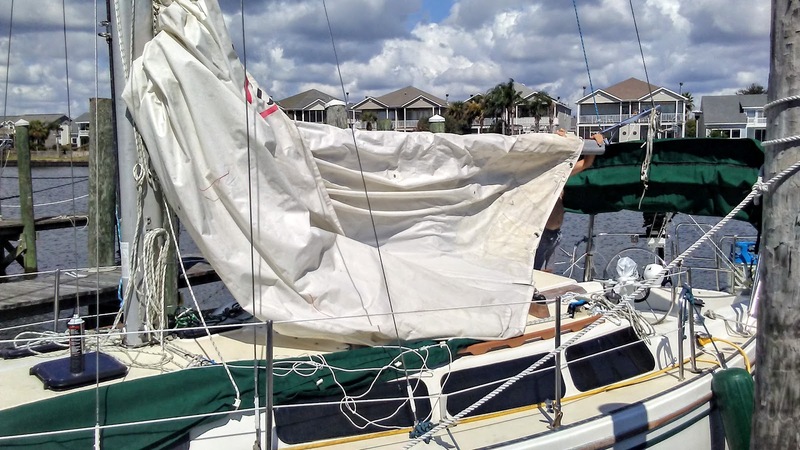 The sail flaked easily into the sail pack, and we didn't have to worry about anything more until we were back at the dock. It was so easy! As we headed back to the dock, we started to get a bit anxious again. We often docked behind our house, which didn't have anything in front of the bow to hit. But now, we had to make sure we didn't come in too fast and hit the dock! Luckily, we docked like a pro and had a big boost in morale after a great day on the lake. We couldn't wait to do it again soon! After posting these photos, I realize that I don't have a picture of the full lazy jack set-up. Basically, there's a block on each side about 2/3 up the mast, then a stainless ring on each side that the line goes through, then another ring on each side that a separate line runs through & attaches to the sail pack. The photo below kinda shows what I'm talking about ... you can see the two rings on each side. We thought we'd have to make some adjustments after testing things out, but so far we're happy with our current set up. We're looking forward to getting back out on the lake again, but Winter came early and we're currently experiencing rain, high winds and high temps in the 40's .. damn it. We're supposed to be in the mid-70's here in Louisiana! With the current conditions, the rigger had to cancel replacing our standing rigging and we haven't gotten back on the lake. We also had to put other boat projects on hold, and we're hoping that we can get back on track soon. Wowza, I was amazed to read how long it had been since you last sailed Nirvana. I know you were thrilled to take her out and raise the sails! Congratulations too on a successful docking; that part of sailing was always my least favorite and resulted in much stress and a few awful moments -- losing a boat hook, banging into pilings, and a few heated arguments. Sounds like you two handled the stress of it very well! Thanks Emily! Yeah .. we've been working on "cruising" for way too long! Not much longer we hope. Docking is always stressful for us .. especially when there's so much time in between.